The macuahuitl is a weapon shaped like a wooden sword. Its sides are embedded with prismatic blades made from a volcanic glass stone. It was similar to a large wooden club with cuts in the side to hold the sharpened obsidian. It is 3 to 4 feet long, and three inches broad. with a groove along either edge, into which sharp-edged pieces of flint or obsidian were inserted, and firmly fixed with some adhesive compound. Since the macuahuitl lacked a sharp point. it couldn’t be used as a stabbing weapon. however the jagged rows of obsidian gave the weapon a vicious tearing power that could cut deep lacerations in the enemy. 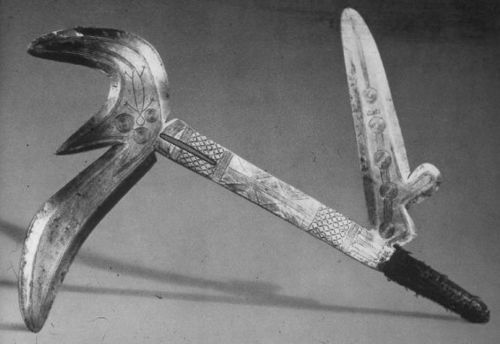 The Kpinga was a bladed throwing knife used by the Azande of Nubia. It had three different shaped blades. They were classed as “Court Metal”, being produced under the patronage of the powerful Avongara clan, and distributed only to professional warriors. The knife (also called the Hunga Munga) was up to 22 inches long. A Filipino sword from the Visayas, Philippines. The weapon was originally intended as an agricultural implement. The grip is usually made of guava wood, which is light. The blade itself is approximately 16 to 18 inches long. Pinuti is Cebuano for “whitened”. As a farm implement, it would take on a dark patina due to contact with plant and animal fluids. When farmers sharpened their blades for combat, the blade was polished clean and white. A traditional Chinese martial arts weapon. 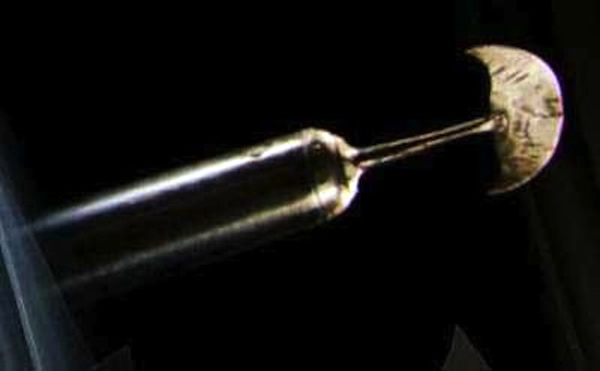 Emeici used for stabbing. They are a pair of metal rods with sharp ends. They are typically mounted on a detachable ring worn on the middle finger, allowing them to spin and be elaborately manipulated. These weapons originated at Mount Emei. They are a piece of equipment used in wu shu to this day. 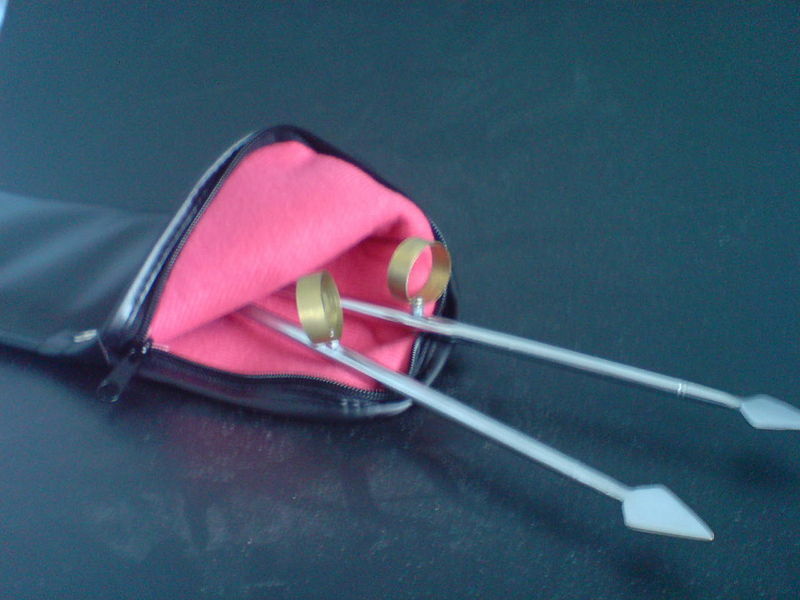 These are used for ‘open palm’ techniques, and are similar to ‘judges pens’. The Chinese weapon, chu ko nu was basically an ancestor to the automatic rifle. It consisting of a bow mounted on a stock that shoots projectiles, often called bolts or quarrels. It sacrificed range and power for a quick reload time. 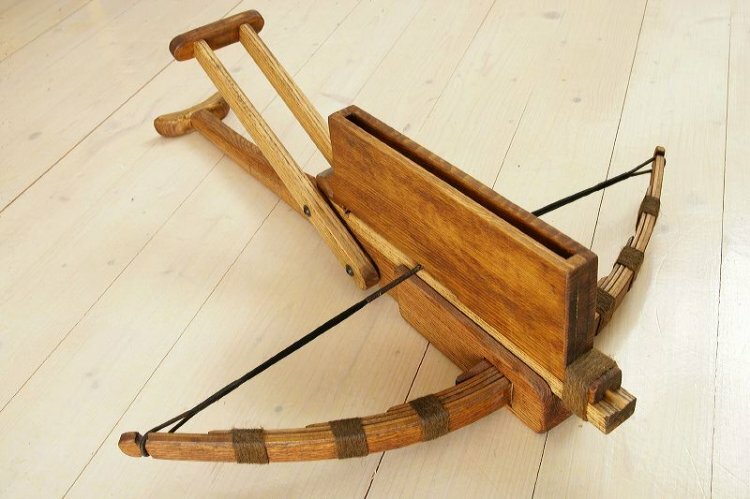 The wooden case on the top of the crossbow held 10 crossbow bolts which fell into place when the rectangular lever on the back was pulled back after firing a bolt. The chu ko nu used last time in the Sino-Japanese wars of 1894-1895. This allows a higher rate of fire than a normal crossbow. There is a magazine containing a number of bolts on top of the bow, and the mechanism is worked by moving a rectangular lever forward and backward. For more effectiveness, some of the bolts were tipped with poison from the deadly aconite flower, also known as wolfsbane. The Scissor was a type of Roman gladiator, meaning “cutter, cleaver, render. This type of gladiator fought using a weapon consisting of a hardened steel tube that encased the gladiator’s entire forearm, with the hand end capped off and a semicircular blade attached to it. A handle inside the tube might have allowed the gladiator to maintain control in the heat of battle. This weapon might have been both deadly and versatile. The gladiator could use his protected arm to block his opponent’s blows and quickly counterattack. The shape of the blade being such that even the slightest touch could cause a serious wound. Originated in Tamil Nadu India, Katar is a weapon of push knife’s type. It is characterised by its H-shaped horizontal hand grip, which results in the blade of the sword sitting above the user’s knuckles. It is the unique to South Asia. and is the most famous and characteristic of Indian daggers. Ceremonial katar were also used in worship. The katar at first glance has a single blade. however when a trigger on the handle was activated, the blade would split into three. One on the middle and one on each side. An esoteric type of pole weapon which was used in Europe as late as the 18th century. It consisted of a pole mounted with a two pronged head. Each prong had a spring-loaded door and could pass over a man-sized object and have the ability to keep it trapped. It was used for pulling men off of horseback and pinning them helplessly to the floor. 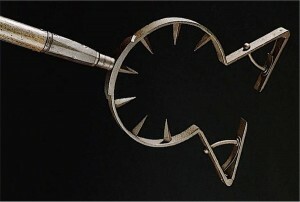 Because of the spikes in the centre, restraint was often minimal. This is one of the few examples of non-lethal polearms. 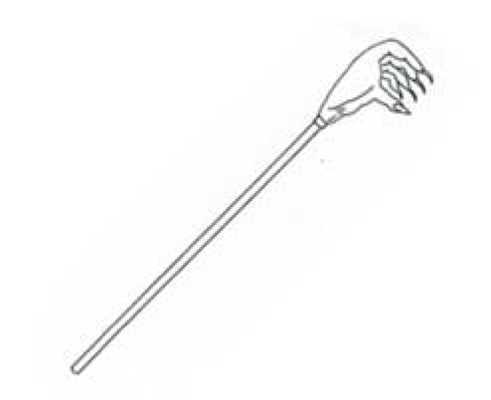 Incredibly odd-looking Chinese weapon, the zhua’s conspicuous iron “hand” at the end had sharp claw-like nails that would impale flesh, and then tear it off from the body. “This was designed to take away shields. And when that shields out of the way, your face is next.” The Zhua would have been primarily used for ripping and tearing at the enemy, though the sheer weight of the weapon could have also made it a useful bludgeoning tool. 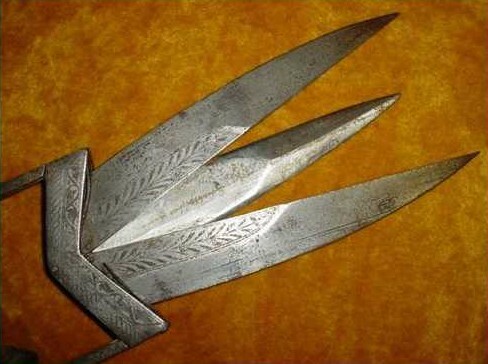 Bagh Nakh is a claw-like Indian weapon. The term bagh nakh means tiger’s claw in Hindi. 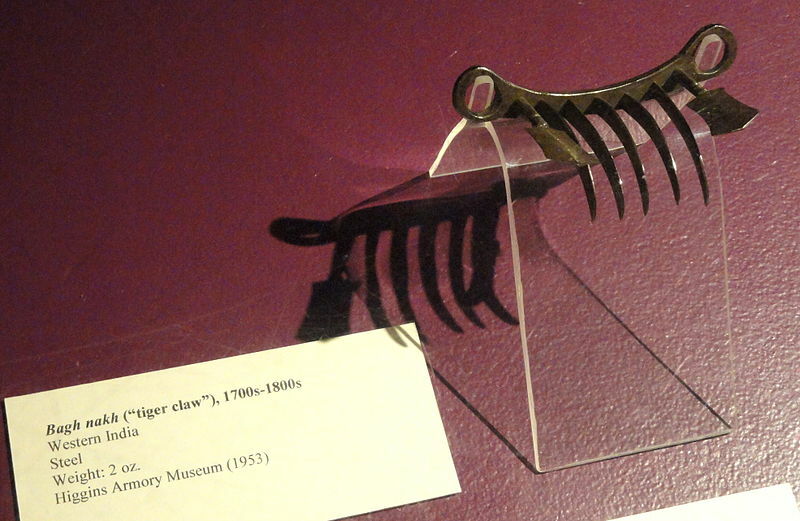 It’s also called tiger claws. It designed to fit over the knuckles or concealed under and against the palm. It consists of four or five curved blades affixed to a crossbar or glove. It is designed to slash through skin and muscle. It is believed to have been inspired by the armature of big cats. Bagh nakh was first developed in India. The first well-known usage of the weapon was by the first Maratha emperor Shivaji. who used a bichawa bagh nakh to defeat the Bijapur general Afzal Khan. After the Direct Action Day riots. the Bengali Hindu girls began to wear a sharp weapon resembling bagh nakh while going to school. in order to defend themselves.